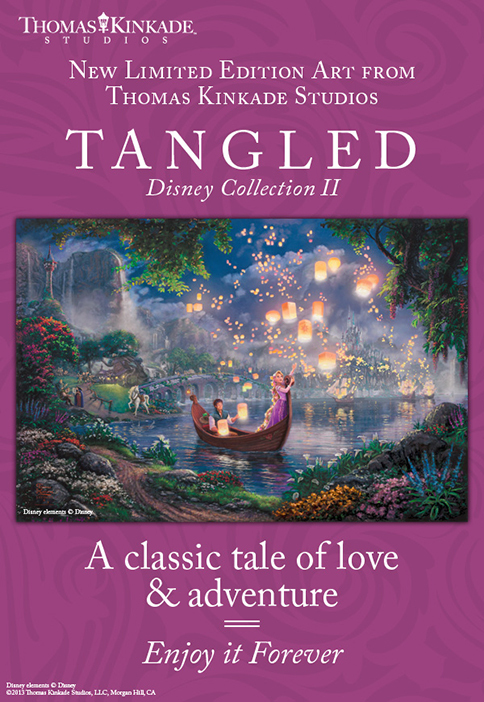 Introducing Tangled by the Thomas Kinkade Studios and $100 Off! "We are Inspired by Art"
Check our Facebook Page for the winners in our Sweepstakes! Tangled is a re-telling of the traditional fairy tale "Rapunzel" and joins other great titles as the 50th addition in the Walt Disney animated classic film series. It is with great pride then, that we at the Thomas Kinkade Studios have worked to fully realize the film's message of following your dream. Tangled reflects a master work of light and romance. This panoramic portrayal captures the newfound love of Rapunzel and Flynn as they boat together on her 18th birthday. Many of the film's unforgettable characters, including Maximus, Pascal and Mother Gothel, are seen on the lake shore. A thousand floating lanterns glow against the starlight of the night sky. "Even the smallest light can fill a darkened room" and "love can indeed conquer all". We at the Thomas Kinkade Studios hope you enjoy Tangled. receive $200 off to continue your collection! This long awaited new release is expected to be in high demand, so make sure to place your order today. Offer good through July 18th, 2013. Must present coupon at purchase. To receive $200 off a Limited Edition purchase of Tangled, just provide your Certificate of Authenticity for The Princess and the Frog to your Art Consultant for verification.Void if duplicated or transferred. Not valid for any other offer or promotion. Not redeemable for cash. No cash value. Not valid on previous purchases or lay-away. May not be combined and may not be used with any other offer or promotion.